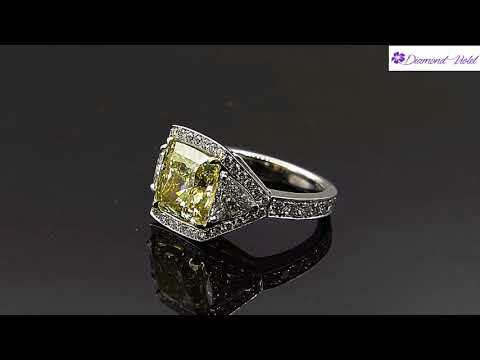 Gorgeous Estate Vintage Diamond Ring with 4.03ct CUSHION Brilliant Center Diamond GIA Certified NATURAL FANCY Light YELLOW Color, SI1 clarity (Eye clear). Beautiful Color, super Brilliant, appears FANCY Yellow, EVEN color distribution! The Measurements of the Center Stone are 8.70x8.68x5.75mm. The Diamond is set into Handmade Platinum (stamped) Masterpiece Halo Mounting with Large Trillion White Diamonds, totaling to approximately 0.68ct, G color, VS clarity overall. The ring is also accented with small round brilliant diamonds around 3 stone and on the band, estimated weight is 1.13; G color and VS clarity over all. This Ring will take your breath away... The Center Stone accented with Yellow Gold prong set basket, which brings out the Brilliance and Natural Yellow Color of the Diamond. The Measurements of the top part are 12.64x18.78mm - HUGE! The Band tappers from 2.82mm to 2.68mm on the bottom. Finger size 6, can be sized. We offer FREE sizing with purchase. The ring weights 10.24 grams, nice and Solid. Sits nice and medium to Low from the top of the finger: 6.57mm. Super Mint Condition, minor evidence of wear, consistent with age. No evidence of wear to the diamond. It sparkles from across the room. Polished and Ready to wear!